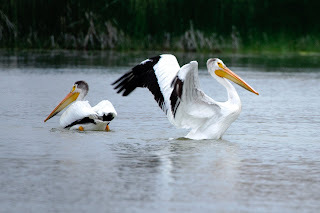 Recently I had a great birding opportunity, brought to me by my friend Tom Stephenson. Tom, as I’ve mentioned before, is an excellent birder and accomplished bird photographer, and it is always a pleasure spending time with him in the field. He was recently invited to go to the Badlands of South Dakota to help the Nature Conservany with a new property they had purchased, and asked me to join. I leapt at an opportunity to both explore a new habitat and at the same time contribute (a little!) to preservation efforts. So once again I relied on those precious frequent-flyer miles, and flew out west. I arrived in Denver — the only airport I could easily get to for free — and rented a car there. The rental agent walked me out to the lot to show me the car, and as we were examining the outside for “pre-existing damage”, my attention wandered…there were a pair of birds chasing each other around across the lot, and then perched up on the chainlink fence. That’s an interesting shape, I thought…looks like a kingbird. I dug into my bag for my binoculars, while going over the rental contract, and took a quick look. It was a pair of Western Kingbirds; this trip was going to be fun! 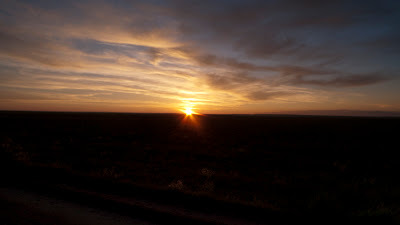 The seven-hour drive took me through NE Colorado, eastern Wyoming, and then into the southwest corner of South Dakota. I passed the time watching for birds, and wound up with a decent little car list. White Pelican, Western Kingbird, Western Meadowlark, Say’s Phoebe, Lark Bunting (in beautiful black-and-white breeding plumage, unlike the one we had last fall on Long Island…not that I’m complaining), Swainson’s Hawk, Mountain Bluebird, and Prairie Falcon were some highlight, all seen at about sixty miles an hour, with only a minimal amount of swerving and rubbernecking, and maybe only one or two “emergency” pull-offs. I got into Rapid City around 6:30pm and met up with Tom and Bob Paulson, who was responsible for buying the new property that we were going to survey. The property is a ranch of about 4,000 acres, located within the Badlands National Park. The immediate area contains about a third of the remaining Black-Footed Ferret population, and consists of long- and short-grass praries, habitats that are relatively rare. Like a lot of people, I have a fairly strong opinion about conservation of habitats like this, based on partial and second-hand information and lots of emotion about “those people” who are “destroying the last of…” blah blah blah. None of it is particularly concrete. That is in stark contrast to Bob, who has been actively working with the ranchers and communities in this area for many years, and has gradually built relationships that will ultimately lead to the purchase the remaining private land within the Badlands park. His goal, and the goal of the Nature Conservancy, is to create a large and contiguous property that is conserved for the future in it’s original, unfarmed state. Bob wasn’t complaining, he was acting, and that was inspirational to see. Here's a link to more information on the project. We went over topo-maps of the property, which had GPS waypoints marked in groups of three. These lines of three were the survey points we would check in order to get a sample of the birdlife across the property. Our job was to help develop a baseline bird number that the Nature Conservancy can then use to compare with future surveys, and also as a guide to manage the property for the future. By seeing which birds are common and which aren’t, they can decide how to manage for diversity. This can be a long process…for a prarie that has been plowed to return to full plant and animal diveristy, ie to return to a mature state, can take a hundred years. Driving out to the property I could see how this habitat could be so easily taken for granted. From a moving car it just looks like, well, grassland. It doesn’t have the same dramatic presence as a mature woodland or costal marshland. In fact, I found that the prarie was more conspicuous in its absence that it’s presence. You don’t realize how significant it is until you drive out of the park and into farmland, past those miles and miles of sterile, agricultural “parking lots”, paved with a single type of plant that is anathema to sustaining anything but itself. In contrast, when you walk out into the prarie you find that the seemingly monotonous grassland is actually comprised of dozens and dozens of species. 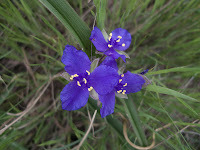 I spent twenty minutes one day photographing some of the different wildflowers we saw (click here): it shows just a little of the variety of life in this place. We stayed at the former ranch house for the property, and for the next three days we got up before dawn went until noon or so, doing our survey lines. Using a GPS device, we’d go to each designated spot and stand for ten minutes, counting all the birds in a radius of 100 feet. Grasshopper sparrows and Western Meadowlark were ubiquitous throughout, and we often counted a half-dozen of each within a count circle. It was surprising to see as we walked how the prairie wold shift in even short distances. Where in one spot you’d have short grass and wildflowers, a hundred yards away you’d be stepping around cacti and spiky shrubs. With these shifts in plantlife there was also a shift in birdlife, so in the gullies we might have Bell’s Vireo, Blue Grosbeak, and Baltimore and Bullock’s Oriole, whereas on the open flatlands we’d have Western Meadowlark, Western and Eastern Kingbirds, Sharp-Tailed Grouse, Lark Sparrow, Grasshopper Sparrow and Field Sparrow. One pond turned up Cinnamon, Blue and Green-winged Teals, Northern Shoveler, Northern Pintail, Killdeer, Barn, Tree and Bank Swallows, and a passing group of Upland Sandpiper. 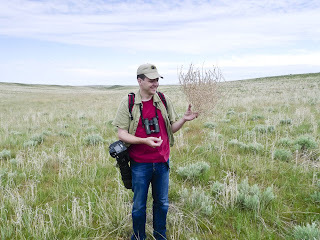 It was interesting how localized some of the birds were…about twenty miles away we checked out a similar prairie that had Chestnut-Collared Longspur, Bairds Sparrow, and large groups of Lark Bunting, while where we were none of those species turned up. The weather surprised me as much as the diversity did. I’d reluctantly packed a wool hat and extra jacket layer, thinking at the time that there was no way I’d need that stuff in late May. On our second day I found myself wearing everything I had most of the time, and still being chilled. It was generally overcast and cold, with a steady wind, and temperatures ranged down into the forties during a couple of mornings. It did warm up in the afternoon once or twice, but if I go back to South Dakota I’m bringing my parka! The afternoons were our time off, since bird activity tended to decrease by 11am or so, and our samples would be skewed if we continued to survey after that. Most of our IDs came from hearing, rather than seeing, birds, so if they stopped singing it was hard to get a good read on what was there. In fact, one morning was so rainy/cold/windy that we stopped by 8am—the birds seemed suppressed by the conditions, and it wouldn’t be a usable sample. We did take advantage of our free time, and spent one afternoon at LaCreek NWR. LaCreek is famous for it’s Trumpeter Swan population, which is largest around Thanksgiving and can number in the thousands. We hoped to see a couple of stragglers in the area, but were unlucky in that regard. We were very lucky, though, to meet up with Tom Koerner, who manages the refuge and who, without prompting, took us on a two hour tour of the place in his truck. Tom has a deep knowledge of the Refuge, and is responsible for keeping it healthy and appropriately managed. In that regard he seemed to be very successful. Managing a piece of land is utterly complex…altering one aspect has ramifications for every other. Maintaing a “wild” state is takes a lot of work, and a lot of intelligence and experience, and it certainly seemed that Tom was well-qualified for the job. He was also extremely friendly, and I found myself inspired again by someone doing the hard, concrete work of conservation while maintaining a palpable excitement about the place he is caring for. It was a short trip..only four days. I had to get back in time to work, and Tom had already been out there for a few days more than me doing similar surveys on a property in Montana. I left Tom in South Dakota and drove myself back towards Denver. 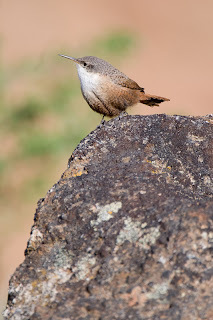 In my typical bird-the-crap-out-of-it attitiude, I managed to get in three hours of birding before my 11am flight, starting around 5am in the grassland areas in Northeastern Colorado. I wanted to try for Cassins Sparrow and Mountain Plover there. I was successful with a single, silent Cassin’s that gave me a brief look before diving back into the brush, and I missed on the Mountain Plover which I think I was a couple of weeks late for (it also didn’t help that I didn’t have a scope with me). 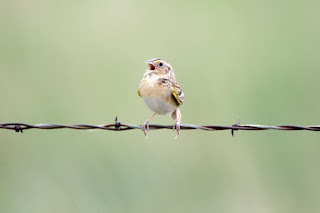 The bird song was impressive on the prarie, with Lark Bunting, Grasshopper Sparrow and Western Meadowlark all singing over there territories, and it was beautiful to watch the sun come up over the grassland. It only cost me a car wash, with some special attention with a stick to getting the two inches of red mud out of the wheel wells before I brought it back to the rental place—if rental companies only knew what we birders do with their cars, they might put some special policies in place! CLICK HERE for lots more pictures from this trip. After being involved in an intensely structured year in 2008, I have really been enjoying not “having” to chase anything that I don’t want to. I can just chill out and watch the birds, take photos, and go where I want! That said, I do enjoy a little competition every once in awhile, so when Tom Stephenson suggested we compete in the photo division of the World Series of Birding, held every year in Cape May, NJ, of course I said yes. The World Series is in its twenty-sixth year, overseen by the well known birder and author Pete Dunne. 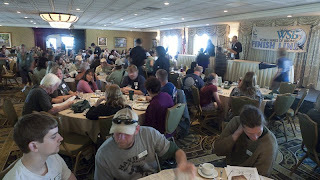 Each year people from all over the country (and the world) come to test their birding skills in a twenty-four hour contest to see who can find the most birds. Over the years the event has gotten more specialized and the number of categories of competition have increased. As it stands, there are awards for the whole state total, Cape May Island only, youth groups, a senior group, highest single county total, digiscoping, staying in a single location, birding without carbon emmisions, and then our category, photography. One would be hard-pressed to compete in the general all-state category…you’d be up against some of the best birders on earth, people with near-mythical hearing and practiced eyes, people who let nothing get by. A number of participants have been doing the World Series for years or decades, and have an encyclopedic knowledge of the state, where to find “backup” birds when the normal spots fail, where the best migration areas are on any given day. Most of these teams start at midnight, listening to (and identifying) flight calls of migrating birds. They also use the nighttime to locate owls and other noctural birds. All this can pay off with massive numbers…the winning team in 2009 had 229 species in twenty-four hours. Actually, many of the teams start long before the actual day, and may spend a week or more in NJ scouting locations and refining their route for game day. What Tom and I do have is photography skills, and field practice in capturing the quick and the skulky in images. Tom, of course, also has great ears, and we both have pretty sharp eyes, so the photo category looked like a place we could seriously compete. Our philosophy was not to try and bird the whole state—too much driving. We weren’t trying to get over 200 birds; in fact, the winning number would probably be under 150. So we just needed to find the densest variety of species in closest proximity to each other. Of course, we also needed spots that were easy for photography…if the birds wouldn’t show themselves, they wouldn’t count. You can’t use electronic calls or other devices to bring the birds out of hiding, so they’d have to come out on their own. Tom had experience with the World Series in previous years with the Zeiss Digiscoping Team, so he had some familiarity with possible routes. We also had an “inside man” at Cape May, Glen Davis, who would give us good info on what was happening the week of the competition. 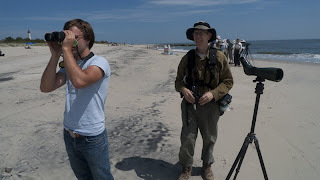 He also introduced us to our third team member, driver and scout Sam Galick, a migration counter for the Cape May Observatory who wound up being invaluable in getting us on birds and getting around the state. On the week of the competition, Tom went ahead and started to scout out our locations. I had a job that week that kept me from going down until Thursday night, so we did a dry run on Friday. We held back a bit, knowing that we’d have to do the real thing the next day, but we still wound up with over a hundred birds on our route, which encompassed the lower third of the state. Southern NJ has a fantastic variety of birds and habitats, and we went through a lot of them, including pine barrens, marshland, shoreline, secondary forest, open fields, agricultural areas, and ocean. We had a quick dinner and were in bed by 10pm for our 4am start the next day. Game day and we up and running before the sun was up. On our way to our first location (the route is part of the game, so I’m going to be vague! ), we picked up our first bird…a Wild Turkey flew up from the side of the pavement and into a tree, and I got a blurry but identifiable shot of it in the near-dark. From there it was go go go, with Tom and I shooting anything that moved, and Sam staying a step ahead of us with the next bird to find and the next spot to hit. Some of the highlights included getting VERY close to having a shot of a Northern Bobwhite that was calling from the side of the road (a passing group of bicyclists scared it off); getting a good shot of a uncharacteristically curious Yellow-Billed Cuckoo, and getting covered with ticks while bushwacking after Worm-Eating and Hooded Warblers. We ran at a good clip, and we were probably up to about 100 species by mid-day, about 8 hours in. We spent some time in Cape May Island, hitting the beach and the fields for birds like Cattle Egret, Common Tern and Northern Gannet. At about three I think we were starting to feel it, but got a second wind that carried us through more of Cape May and up to our final spot in Brigantine. It was basically dark when we finally finished, sixteen hours later, and got in the car to head back to the Cape May headquarters to turn in our photos. I worked feverishly to sort through the 2500 or so shots we’d taken, edit, rename and export them to a disk. We had until midnight, so I spent some extra time getting each image corrected, and worked with RAW files instead of JPGs…it takes longer but it sometimes looks better. I finished and burned a disk at about quarter to midnight, and we handed in the disc, satisfied that we’d birded and photographed as hard as we could that day. The next morning we showed up to the brunch/awards ceremony, where dozens of teams gathered in a big conference room at a local hotel. We were pretty confident that we’d done well against our competition, but when we got there we saw that our team didn’t have a final species number listed next to it on the bulletin board. I started to get an ugly feeling, and Tom went to talk to folks and see what was going on. Well, sometimes the effort is its own reward, and in this was going to have to be one of those times. The administration for the Series had initially changed the deadline for team submissions to 10pm, but then a couple of weeks before the day sent out a new email that said the deadline was midnight. What they didn’t say was that the photo teams were still supposed to turn in photos by ten. So we had turned in the photos late, even though we were at headquarters at nine, and even though we could have turned in the photos before ten if we’d known (we could have used the JPGs that we had, instead of messing with the more time-consuming RAW files), the panel decided that they had to disqualify us. That was a bummer, since we had indeed “won”, with 132 species…the next closest team was 125. Overall, people we’re nice about it, and Pete Dunne had the room give us a round of applause for our effort. As I told Tom, it was an involuntary practice run, and it would just make us sharper and faster for next year's World Series, which we will certainly be in. If you'd like to see a gallery of all the birds we photographed that day, click here. It's been six weeks since the end of 2008, and I've been adapting to a life without constant chasing. 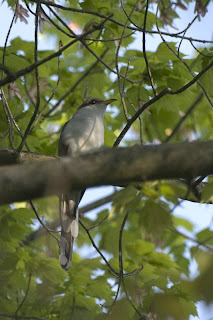 I've been going over the birds of 2008, and I created a Google map of where I saw them (see links at right). I'm submitting my record to NYSARC as 348 birds for the year (neither Pink Footed Goose nor Scott's Oriole are on the countable list yet, Scott's Oriole since it was a first for New York, and Pink Footed because there has been some question of whether these geese are escapes or wild). As for going out, I've been doing a lot more in Prospect Park. I led a tour there on Valentine's Day, and we had some very nice birds, including Siskin and Purple Finch. I've also been photographing birds in snow, and am really pleased with some of the images I've gotten so far. Now all that is not to say that I haven't done a little chasing in 2009, but I'm trying to limit it to life-birds only. The year started with the Thick-Billed Murre that showed up in a lake in Hemstead Park on Long Island. I had amazing looks at it with Shai Mitra and Doug Gochfeld, and photographed it as it floated within feet of the shore. This is normally a bird seen only on the ocean, so there were concerns that there was something wrong with it. Sure enough, it was found dead on the lake a couple of days later. There were also two interesting "non-countable" birds nearby on the Island: Eurasion Teal at a nearby lake, and an Audobon's Yellow-Rumped Warbler out at Oak Beach, a very rare bird for New York even if it's not a separate species from the Myrtle Yellow-Rumped. Jess and I took a trip to Block Island in January, and took a shot at Tufted Duck in Providence along the way. No Tufted, but we had Black Guillemot and Common Murre from the ferry, as well as a surprise appearance of a Northern Fulmar! While we were up there the Ivory Gull was reported in Massachussetts, and I just couldn't resist. I stayed over and was in Gloucester the next morning before daybreak. One other birder was there, and we waited as the sun began to dimly illuminate the snowy scene (it was mixed snow/rain that morning). We began to see forms in the air...just the shapes of gulls moving towards and then past the point we were on. 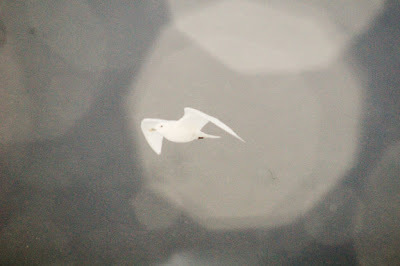 We strained to see the ghostly white ivory gull, and several times thought we might have it, but each turned out to be an Iceland Gull...normally a good bird, but in this situation something to note and discard. The other birder walked a little way down the rocky shore, and then suddenly I saw a bird whiter than the Icelands, whiter than the snow itself, come soaring in from behind us. "Ivory!" I was shouting, "Ivory! ", and the other birder was now shouting it, too. Over then next hour several more birders arrived, and we watched the gull as it glided right over our heads, and then landed just a few feet away on a patch of ice. I would watch it for several minutes, and then look around a bit at the other gulls (which included probably a dozen Icelands, one or two Glaucous, and a very good Thayers candidate), and then look back for the Ivory, startled again as if seeing it for the first time. It's the most striking bird I think I've ever seen. On the way home I stopped for the Bullock's Oriole that was coming to a feeder in mid-state New York, and then worked my way back to Brooklyn. In early February Jess's sister had a baby, so we drove to Cleveland for the briss. Of course, we had to do a little birding...on the drive there I counted 33 Red Tailed Hawks, plus a Black Vulture, many Turkey Vultures, a couple of Red-Shouldered Hawks, and a group of Ravens. 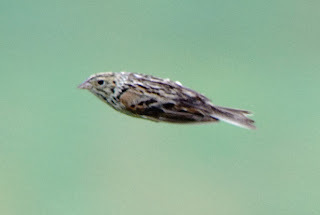 On the way back I got in touch with some folks in Pennsylvania about a Harris's Sparrow that was coming to a feeder there. We met up and were lucky enough to have the big, unmistakable bird come in and give us very nice looks. Finally, I went back up to Rhode Island for the Tufted Duck, and not only found it but also saw the reported hybird Tufted Duck x Scaup...an odd bird that has white flanks, a dark grey back, and a mini-tuft. It was gratifying to have both after having missed them in January, and it was an education to see the hybrid...something to file away for when I'm scanning big Scaup flocks in the future. So it's back to birding as usual, with just enough chasing to keep things spicy, and if the winter is any indication, we seem to be headed for another good year in birding.